The sourdough lives! I have a living entity in my refrigerator. It is still alive (since August 19). It even has a name! Sougdough by Robin Sloan is the August/September selection for Cook the Books. 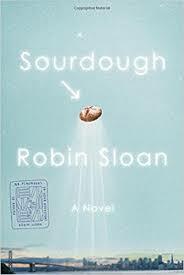 I loved this quirky book about mysterious immigrants, robots, and sourdough. It’s an odd combination with an equally eccentric cast of characters, but Sloan makes it work. He weaves this tale of mystery and magic together and has us suspend disbelief. I did believe that Lois’ sourdough had special powers. Sloan’s descriptions are inventive as well. The Marrow Fair facility (the home of the alternate farmers market) is described as having “the powered-down gloom of a high school at night” (98). Having been in high schools at night, I know exactly what image he is wanting us to visualize. The farmers market was eerily realistic with offerings of Chernobyl honey and magically masked sourdough. The speculation among the vendors that Anthony Bourdain (RIP) might be the mysterious benefactor gave me pause. 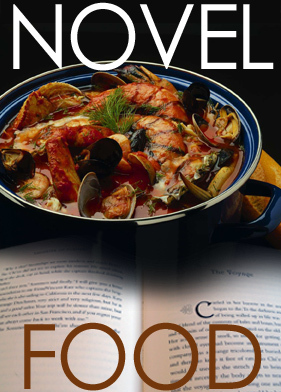 The food in the book, as you would imagine, is plentiful. There’s all sorts of other things from the Marrow Fair, cricket flour, Lembas, “gemlike cheeses,” fish, espresso, mushrooms. Sourdough à la Masque (139) with smoked salt and bone marrow from Café Candide. 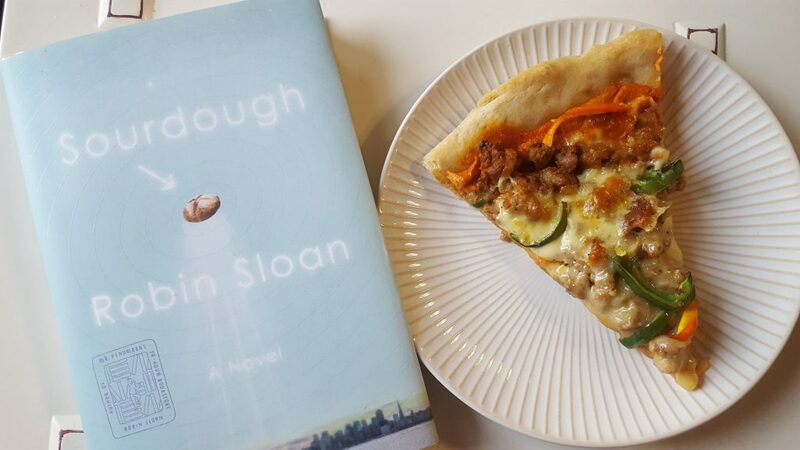 I am sure I missed other references, especially as the plot thickened (pun intended) with intrigue as to whom Marrow really was and if the magical Magz sourdough would overtake San Francisco. As referenced here, I was determined to establish a sourdough culture, get it to live, and actually make something. I was struck by Clingstone’s challenge to Lois regarding her robot making pizza dough. Here is my version of sourdough pizza crust and, wanting to keep in the spirit of a farmers market, I loaded it with local toppings. I know it’s not exactly a robotic arm, but I was glad to use my stand mixer and the dough hook to knead the dough. Add the water, flour, salt, and yeast. Mix to combine, then knead until smooth and slightly sticky, about 7 minutes at medium speed using a stand mixer with dough hook. Place the kneaded dough in a lightly greased container, cover with a clean kitchen towel, and allow it to rise until it’s just about doubled in bulk. This might take 2 to 4 hours; it might take more. Drizzle olive oil into a 14″ round pizza pan, tilting the pan to coat with the oil. Shape the dough into a flattened disk or oval. Place it in the pan, cover it, and let it rest for 15 minutes. Push the dough towards the edges of the pan; when it starts to fight back, cover it and let it rest for 15 minutes. Then, finish pushing it to the edges of the pan. Cover the pan, and let the dough rise until it’s as thick as you like. Towards the end of the rising time, preheat oven to 450°F. Pre-bake the crust for about 8 minutes before topping. 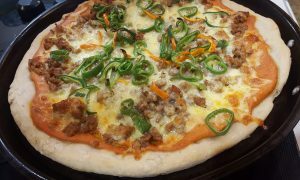 Add toppings (see below), then bake until toppings are hot and cheese is melted and bubbly, about 10 minutes. For thin crusts, bake for 4 to 5 minutes, then top and bake for an additional 8 to 10 minutes, or until toppings are as done as you like. Whatever you can harvest (or salvage) from the garden, like sweet peppers. I am a sourdough neophyte, so I was a little unsure as to why I needed regular yeast in this recipe. I still don’t have an answer for that but let me tell you, when I sprinkled the dry yeast on the starter, it did really look like a skirmish was about to break out. We do love this dough and the starter is still rockin’ along. I usually use it at least every weekend. I’ve made this pizza dough three times and most recently made sourdough biscuits. I would recommend this recipe which makes a silky dough that yields a fluffy biscuit. I am going to take a lesson from some of my fellow CTB members and make sourdough bread as soon as I am able. And if you’r interested in the music of the Magz, check out what Sloan has done in creating the soundtrack of his book. If you’ve read Sourdough, whip something up and join along. Posts are due on September 30, 2018. 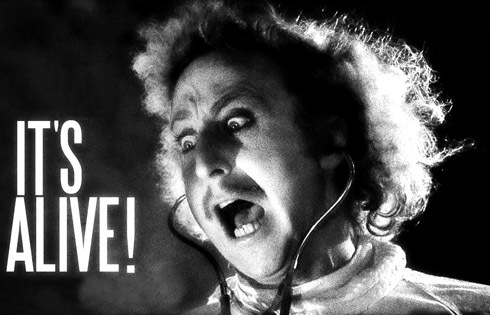 You can email eliotseats@gmail.com with your post or leave a comment on the Sourdough announcement on the CTB website. 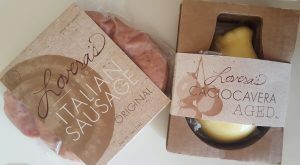 I am linking up with Foodies Read. I am always craving pizza! You really captured the magic of Sloan’s novel ! I loved it and all its quirky characters (human and not). Your pizza looks fabulous. Thank you for that, Mae. I love quirky so will have to hop over to Amazon. And I love pizza, yours looks fantastic. Haven’t had sourdough starter in years and will have to change that now. Thanks! Good for you Debra….I am a chicken and I am very impressed not only with your starter but also with that yummy looking pizza. I was impressed with your yummy appetizer, Wendy. It’s great to read what others have posted because it reminds me of everything I missed in the novel. Having living things in the kitchen is addictive, Debra. They are like pets. Leavening by sourdough starter alone takes a long time. The addition of a bit of yeast speeds things up (there may be some other reason related to the specific recipe). Your pizza looks great: I like the idea of harvesting what you can from the garden for the topping. It is addictive and I constantly worry I will kill it! Haha. Thanks for the yeast explanation. Your pizza sounds fabulous, and I’m looking forward to trying those toppings with my new sourdough. If it gets here safely and I don’t kill it right off. I loved this book both times reading it. I have my fingers crossed for you and your sourdough, Claudia! Glad you loved the book! YAY! I’ve had this book on my wish list for a while. Need to move it to hold. 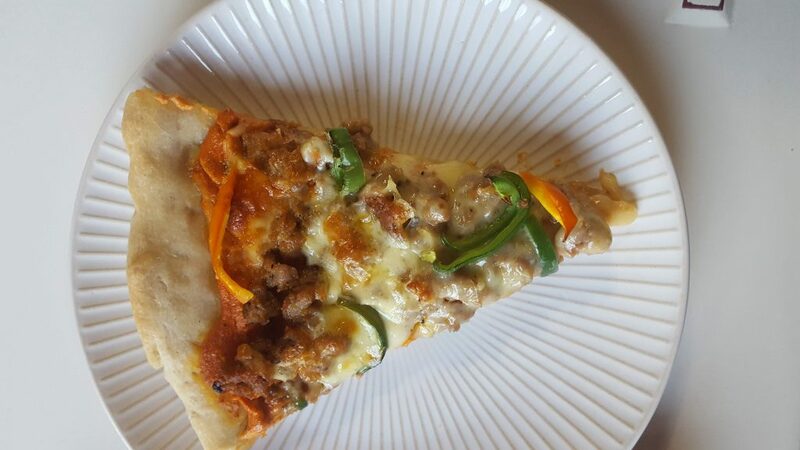 Thanks for the review and for the pizza recipe. Now you having me craving pizza! MJ, check out other’s inspirations at the CTB Roundup. I love the direction you went with your CTB post, Cathy. That’s what I love about that club’s membership, the creativity! I’m a big fan of sourdough pizza and yours sounds like a delight. Although I admit that I’ve always failed to keep the starter alive for long. 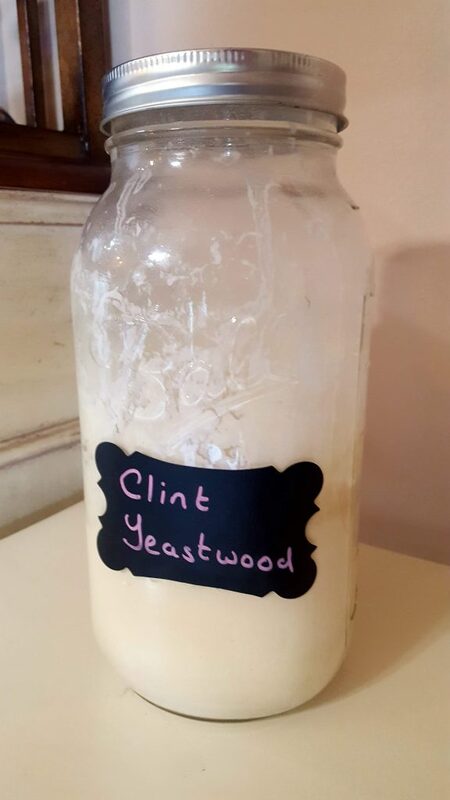 I think I might have shown it more respect if I’d named it Clint Yeastwood. That sounds like a fascinating book.